We are of the belief that a perfect smile is the result of many different factors and processes put together. Unlike cosmetic makeup or a new hairdo, we believe that a radiant dazzling smile is the key to transforming an individuals life and giving them a regained sense of self confidence and boost to their personality. We boast of an elite team of higly-trained aesthetic dentists, who are masters of their art and have performed more than 5000 successful cases of smile makeovers. This combined with the most advanced of technologies and world class infrastructure ensures that each patient we attend to leaves with a bright smile on their faces. Having always been pioneers at introducing innovative technologies for dental processes, one such technology we have pioneered is called Digital Smile Design (DSD). Rather than just the clinical aspect, we believe in focusing on individual aspects of the patients too; and integrating them in this process to make them co-designers of their own smile. With DSD, we hope to present a more emotional, artistic and humane facet of dentistry to the world that eliminates unnecessary fear or doubt and involves the patients in what would otherwise seem like a daunting or complicated process. Excellence in aesthetic dentistry is no easy feat. It is achieved through a systematic approach by diagnosis, treatment planning and execution which brings our patients the smile of their dreams. Our goal is to involve maximum patient participation to ensure a renewed doctor-patient bond. After all, nothing brings us more satisfaction than a patient showing off his brand new smile, ready to take on the world anew. 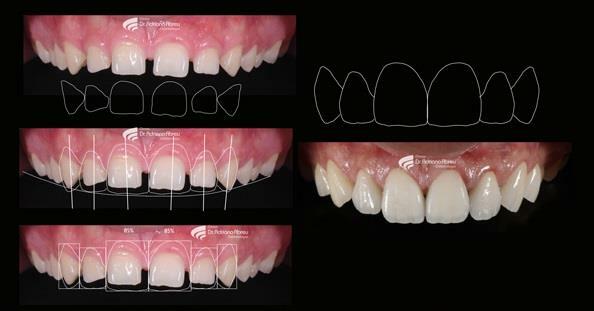 DSD is a multipurpose concceptual software for smile design which has many advantages over conventional smile design.